The fatty tissue in our cheeks (referred to as “Buccal fat” in medical terminology) represents a significant portion of the physical makeup of our faces, as it begins at the sides of our foreheads and extends through the lower cheekbone, ending at the corners of our lips. Distinctions in the appearance of our Buccal fat are influenced by a number of factors that range from family history to ethnic background. Because of this, some of us may bear an appearance commonly known as “chipmunk cheek,” where we can look as if we have something stored in our mouths when we smile, and in severe cases, when we are not making any facial expressions at all. Although our cheek fat is widely considered to be responsible for giving our faces an attractively fuller and firmer look, the Buccal fat is primarily responsible. However, to consider the Buccal fat as a simple volume of fatty tissue in our cheeks would be anatomically irresponsible. First, your lifestyle must be taken into consideration. It is very rare to see overweight individuals with slim faces. Second, heredity must also be given serious consideration. There are many cases of individuals over 170 cm in height and around 45kg in weight but still have chipmunk cheeks because it is common among their family members. The aesthetic benefits of removing fatty tissue include more well-defined contours along the upper and lower parts of the cheek, as well as an overall more refined appearance of the cheek. In the past, simple ‘cheek fat’ was the term preferred to Buccal fat, and so was commonly mistaken for cheekbone reduction. 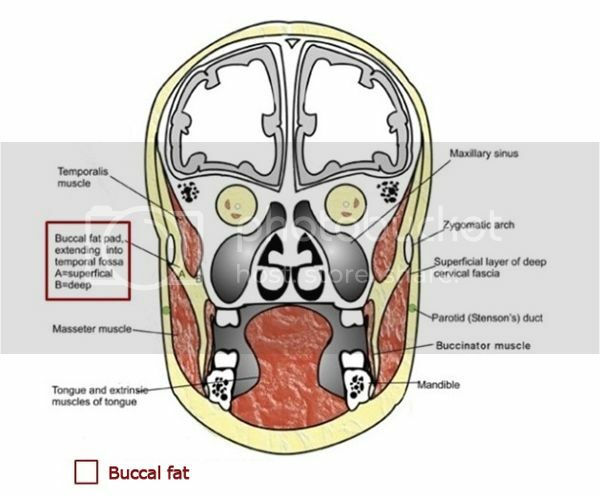 Buccal fat is very different from stomach and waist fat in both its form and appearance. Simply speaking, Buccal fat is a much more dense and sinewy form of fat. As such, it cannot be removed through suction, but rather a small incision 0.5 cm in length made in the skin near the canola. This incision is made on the inside of the mouth, leaving no visible car after surgery. For first time patients, age is the foremost factor that must be considered. In many cases, the Buccal fat in patients who are in high school or college is composed mainly of baby fat. As time passes, this baby fat will gradually disappear. Oftentimes we see pictures or read stories online of celebrities whose appearances have changed rapidly and suddenly; their faces appearing longer and more slim. Although many consider these changes to be the result of surgery, but they actually occur naturally as baby fat fades. Therefore, this surgery is best for those who have allowed ample time for their baby fat to disappear, and who regularly exercise to maintain a fit physique. Conversely, there are cases of hyperplasia of Buccal fat. This is referred to the so called real “Buccal fat.” Its appearance remains despite exercise and changes in diet because it is linked to genetics. Still, we cannot attribute 100% of our appearance to genetics alone. An example of this is when we look at groups of African Americans residing in certain parts of the United States. 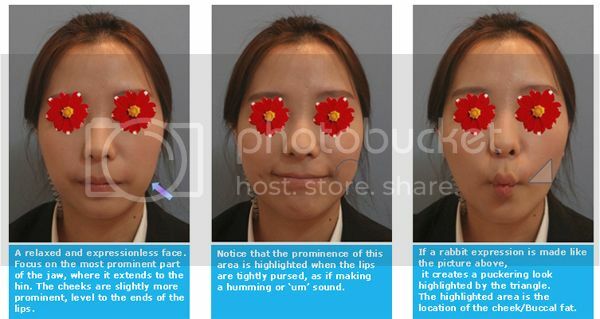 The varying appearances of their cheeks can be attributed to things such as environmental factors, and simple habits such as how hard an individual bites down when eating food. As such, these same environmental and habitual patterns are paralleled among people in Korea. 2. The baby fat on either side of our cheeks protrudes, giving the appearance of being overweight, even in those who are fit or slim. 3. Buccal fat is visible. The formation of this appearance is due to the Buccal fat in the upper part of the cheek in conjunction with the fat in the lower part that causes the double chin. This can also, in addition to those whose lips naturally curve downward, unintentionally give off a negative or sulking demeanor. 4. Many elements are necessary to influence the 'V-line' shape on our faces, and to achieve it we look to things such as facial contouring, Masseter reduction, and Botox treatments. But for those who have undergone all those things and are still unsatisfied must strongly consider the impact of our Buccal and chin fat. 5. Those who have received jaw reduction surgery often complain of saggy cheeks, but this is due to inferior Buccal fat that remains after the surgery. Although the effects of swelling from surgery appear immediately, it is mild and not life-threatening. Typically, about 3-4cc of fatty tissue is removed from each side, and considering that an average hard candy or cough drop is about 1.5cc in size, a relatively large amount of fat is excised. 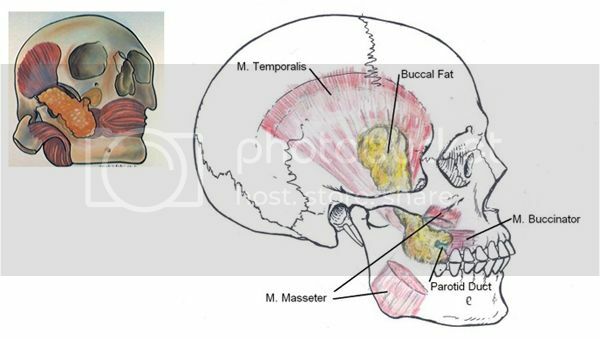 The parts highlighted in yellow show the general location of the Buccal fat, but as it extends down to the chin and throughout the face, it is difficult to tell its exact location entirely. Because oral distinctions vary by person, the above diagram is not accurate for everyone. The subcutaneous fat that creates contours along the outside of the face vary greatly, and instances of thicker Buccal fat can complicate procedures. Because Buccal fat cannot be removed via suction, it is usually removed directly by creating a 0.5 cm incision on the inside of the mouth. The Buccal fat is very tough and sinewy, thus cannot be separated easily. Understanding its form and nature allows for much easier removal. Removal via suction or a laser could risk damage to salivary ducts or vital nerves. Therefore, a precise knowledge of the Buccal fat and how it interconnects with the surrounding areas must be known in order for a successful surgery to be conducted. To maximize the potential for the best results, an Accusculpt laser is used for Buccal fat removal. It can be removed along with the skin fat. Tightening of the skin can also promote growth. Women of younger age and better skin complexion can achieve better results through Buccal fat removal, and those results can be further improved through Masseter reduction with Botox. Admittedly, there are some patients for whom diagnosis can be a little vague. For patients who are overweight, for example, it could be difficult to distinguish specific areas of the chin, as the fat in the chin could overlap or be superimposed with the Buccal fat. Which surgery the patient elects to undergo first is up to the patient and the discretion of the doctor. Usually, the area that concerns or stresses the patient the most takes precedence over other procedures. The effects of the surgery are visible immediately after swelling subsides. As the swelling following Buccal fat surgery is not very severe, recovery usually does not interfere with a patient’s daily routine. About 3 to 4cc of fat is removed from each cheek during the surgery. For comparison, the average hard candy or cough drop is about 1.5cc in size, so quite a lot is removed during this procedure.